The TXV valve (thermostatic expansion valve) is an AC part designated for regulating the rate of flow of refrigerant in your air conditioning system. As you can imagine, you need this component to operate properly in order for your system to work efficiently and effectively. 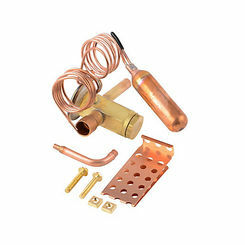 You can save on a variety of replacement parts for your AC unit by shopping with PlumbersStock. Save on discount Meridian, ADP, and Ducane TXV valves and have them ordered directly to your door. What Is a TXV Valve? 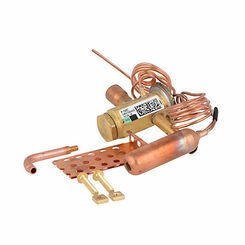 A TXV valve stands for thermal expansion valve and is a precise component in AC system that controls the amount of refrigerant that flows into the evaporator. This is important because the controlled flow is necessary to maximize your AC’s efficiency while preventing refrigerant backflow to the compressor. Because of their function, TXV valves are often referred to as “metering devices". Your TXV valve plays a very important role in keeping your AC system running properly, so it’s worth noting how this valve works under normal conditions. 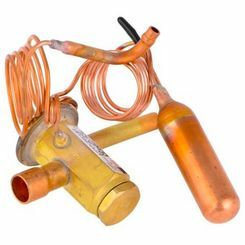 The flow of the liquid refrigerant is hindered by the valve pin. As the flow is restricted, the pressure in the refrigerant drops, causing a small amount of the refrigerant to be converted to gas form as response to the drop in pressure. This “flash gas” combines with the rest of the low-pressure liquid refrigerant and moves on to the evaporator. The rest of the liquid refrigerant is then “boiled off” until it becomes a gas and is capable of absorbing heat energy. 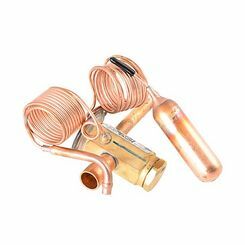 Your TXV valve is designed to do one thing only: meter the proper amount of liquid refrigerant into the evaporator coil. Unfortunately, there are some misinformed people who believe this valve is capable of controlling other factors, including humidity, head pressure, suction pressure, and air temperature. The TXV valve is NOT meant to control any of these and assigning this valve to control this variable could result in the compressor failing and limited system performance. If your TXV valve fails, you can expect to see a change that directly affects the evaporator, leading to the evaporator being “overfed” (flooded) or “starved” (underfed). An overfed evaporator can be observed by checking the refrigerant superheat value at the outlet of the evaporator and receiving a lower than normal measurement. Inversely, a starved evaporator can be observed by receiving a higher than normal refrigerant superheat value. 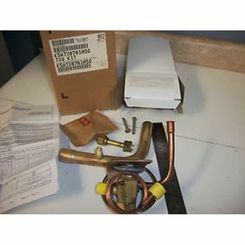 A malfunctioning or faulty TXV valve may cause the higher or lower refrigerant superheat value, but keep in mind other factors may be inhibiting the valve’s performance and these possible suspects should be investigated before attempting to replace the TXV valve. If you’ve determined that your TXV valve is defective, there’s no better place to purchase a replacement valve than here at PlumbersStock. We offer top-quality TXV valves from manufacturers you know and trust, all for a fraction of retail cost. As a wholesale company, we strive to offer our customers the best products at the lowest prices, so we promise you won’t find a better price anywhere else on the web.